Most people understand the principle that PVC Strip Doors contain the cold by reducing the hot and cold air exchange when door is open. But there is more going on than the obvious. Controlling the air exchange also reduces humidity and dust. You can purchase PVC Strip Doors online here. Controlling humidity in the Cold Room, reduces the ice build up on the back of the evaporator. In severe instances a block of ice can accumulate blocking the air flow completely. Evaporators that become blocked by ice or dust become inefficient causing the Condensing unit to work overtime. Condensing units have a compressor which pumps the gas. If a compressor overheats, it is shut off by the thermal cut out switch located on top of the compressor, commonly mistaken as a breakdown. Tests using temperature and humidity sensors before and after a Strip Door has been fitted show remarkable results. Our Ribbed PVC Strip Door is designed for Cold Room environments above 0 degrees Celsius and are extruded with ribs to stop PVC door strips sticking together. Data logs provide statistics of the cycles of the condensing unit. 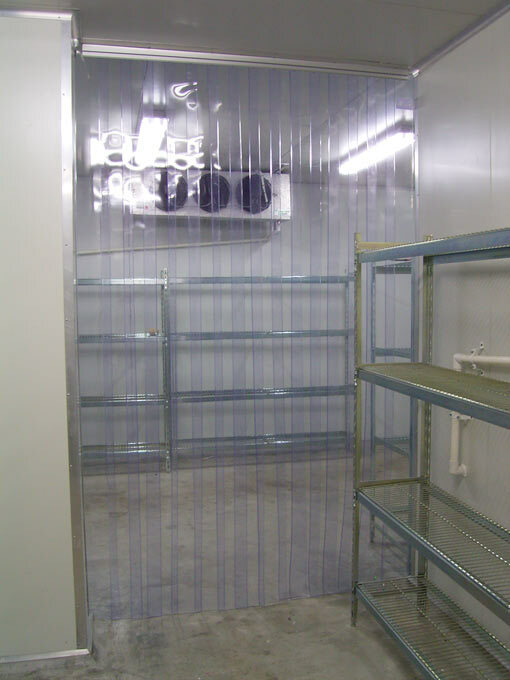 Condensing units cycle off for longer and compressors run at a cooler temperature with PVC Strip Doors. Customers have reported electricity savings of 30 to 40% just by installing Cold Room Door Strips. If you’re questioning the convenience of having a PVC Strip Door, ask your-self ”how convenient is it when a Cold Room breaks down”, or you receive an unwanted high electricity bill.